There were several life-changing events going on in my world when I decided to join the Marine Corps. I was born into a large family of nine children in 1930 and raised in Isle, Nebraska, during the Great Depression. Like most large, blue-collar families of the period, we struggled to stay afloat. My father worked hard as a cement contractor and brick and block layer. It the warm weather he worked a lot. In the winter months not so much. My mother worked from sunup to sunset every day cleaning, cooking, washing and sewing clothes for me, my father and my four sisters and four brothers. Twice a week she baked bread, cinnamon rolls and on special occasions, pies and cakes. One of my fondest memories is her giving us hot bread right out of the oven covered with melting butter. She also made sure all us kids went to church every Sunday. When I was seven or eight, the world was in crisis from both economic pressure and ethnic conflict. Adolf Hitler, the leader of Nazi Germany, stormed into eastern Europe, seizing Czechoslovakia, Poland, Finland, Norway, France and other nations. He ordered his SS Gestapo to round up Jews and put them in death camps. The Italian fascist dictator, Benito Mussolini, raided and occupied Ethiopia. He banned Italian Jews from professional occupations. Japan’s leader, Gen. Hideki Tojo, occupied much of China and took possession of British and Dutch colonies in the Pacific. In one exceptionally heinous crime in 1937, Japanese military forces marched into Nanjing and systematically raped, tortured, and murdered more than 300,000 Chinese civilians. I remember how outraged the older folks were over the wanton slaughters, imprisonments and human degradation being carried out by Hitler, Mussolini and Tojo. But I also remember most of them saying it wasn’t our problem and we should stay out of it. But that attitude changed overnight on Dec.7, 1941, when the Japanese, without warning, bombed Pearl Harbor, killing 2,402 Americans. The next day the United States declared war on Japan. Three days later, Nazi Germany declared war on the United States. In a matter of a few days, our nation turned from isolationists to one frantically building for war. Caught up in the wave of patriotism sweeping the country, two of my older brothers, Marion and Lloyd, signed up in the Army. Marion never left the states, but Lloyd fought in most of the battles in Europe as a member of Lt. Gen. George Patton’s Third Army. He was also a prisoner of war twice. The first time was when our forces crossed the Rhine River into Germany. He and others were captured but within a few day were liberated. He was captured a second time and remained a prisoner until the war ended in 1945. Lloyd was awarded the Bronze Star. I quite school in the 8th grade and worked full-time with my dad pouring cement foundations and laying blocks. Increasingly, I began to distance myself from my dad who was a harsh, quick-fisted, short-tempered man. At 16, I left home for good. I traveled from state to state in search of available work. 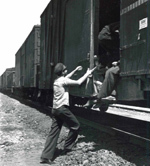 Sometimes I would hitchhike, other times I would jump freight trains. I rather enjoyed travelling around seeing different parts of the United States and once I had a little money ahead, I’d moved on to the next place. But competition was fierce. Wherever I’d go, there’d be other boys like me, men of all ages and a lot of World War II veterans, all looking for work. Hearing the veterans talking about their experiences, I felt a surge of patriotism and excitement. As soon as I turned 18, I quit my job carrying shingles for two roofers in Ft. Smith, Ark. and enlisted in the Marine Corps. 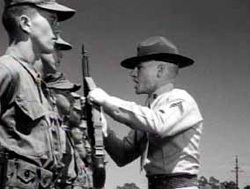 I signed up for the Marine Corps on July 29, 1948 and within a week, I was raising my right hand at the induction center and two days later, put on a train with a bunch of other recruits and sent to Marine Corps Recruit Depot in San Diego. While I watched other recruits struggle with the physical challenges of boot camp, I did not. I was in good physical shape from my two years of hitchhiking around the country searching for odd jobs and was used to walking long distances when I couldn’t get rides. The work I found was back-breaking, but it also laced my thin frame with strong, flexible muscle. So if any of my drill instructors (DIs) told me to drop for 25 push-ups, no problem. But what I wasn’t ready for was the strict discipline and the harsh penalties for slowness or inability to accomplish tasks like marching and rifle drills. I also had trouble with our DIs yelling at us like we were the lowest living thing on the earth. Worse was my having to do what was told of me without question. If any of us were slow in getting the point, our senior DI, Staff Sgt. Chatham, would not hesitate to ‘clobber’ us until we totally understood what point he was making. Toward the end of boot camp, however, I saw how he and the other DIs had shaped raw, fumbling civilians into tough Marines. As I stood proudly on graduation day, I silently thanked them for helping me get there. When I got out of boot camp, my entire recruit platoon (Platoon 72), along with other Marines already at Camp Pendleton. CA, were assigned to the newly reactivated 1st Provisional Marine Brigade. Within days, we were loaded onto the troop ship USS General W.F. Hase and taken to Camp Witek, Guam. The trip to Guam seemed like it would never end but finally, after 31 days and 30 nights of sailing rough seas, we set anchor and stepped onto the island that would be our new home. We were taught infantry tactics at first and then continuously ran field training exercise to refine those skills. We were also taught survivor skills by Master Sgt. Potter, a World War II Bataan Death March survivor. He was a tough old guy who earned our respect for what he knew and what he taught us. Our company commander was Capt. Robert Bohn, who retired a Maj. Gen. in Sept. 1974. Sixteen months after arriving on Guam, Typhoon Allen ripped through Camp Witek, destroying everything standing. The entire brigade was shipped back to Camp Pendleton where we continued training. A couple of months later, on June 25, 1950, North Korea attacked South Korea, crushing its army and within a couple of days captured Seoul and was moving rapidly down the Korean Peninsula. Among the casualties were some of the 481 American military advisors. To stop the onslaught, the United Nations rushed in military forces from 16 member nations. Our unit, the 1st Marine Provisional Brigade, left Camp Pendleton in mid-July, boarded ships in Long Beach and San Diego and landed at Pusan, South Korea, on Aug. 3, 1950. For the next seven months I found myself in combat nearly every day. 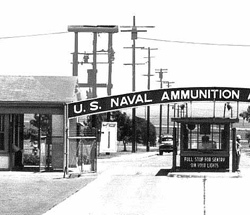 When I left Korea, I was sent back to Arkansas to finish off my enlistment at the Shumaker Naval Ammunition Station near Camden. But that’s when the Marine Corps pulled a fast one on me. They involuntarily extended my enlisted for one year and sent me to Parris Island, the land of sand fleas and reptile-filled swamps. Surprisingly, it turned out to be a highly rewarding and character-building assignment. I was made a junior DI. I couldn’t help but remember how I had cursed my DIs when I was in boot camp and here I was, doing the same things all other DIs had done for decades, meaning I was tough on the recruits. But I was also fairer than most DIs. When the senior DI was transferred, I took his place by default and graduated Platoon 431 by myself. Next I was given an even greater challenge. I had to turn a “slow platoon” of less than sterling recruits into Marines. With the skills I had learned from my DIs and what I had learned the short time I had been a DI, I managed to graduate most of Platoon 26. I was very proud of my accomplishment. My superiors commended me for such outstanding work and asked me to reenlist. I thought about it, talked with others about it and thought some more about it. I could not make up my mind but finally came to a decision. It was time to move on to new adventures. In August 1952, I passed through the front gate of Parris Island for the last time and headed back to Arkansas a civilian. I saw a lot of combat in the Korean War. Some were small firefights, others were among the most important battles of the entire war. While all the battles were highly significant, the one that stands out above the rest was the bloody 17-day battle in subzero weather at the Chosin Reservoir where we were outnumbered by the Chinese 8-to-1. It has been called by many historians one of the fiercest battles in Marine Corps history. 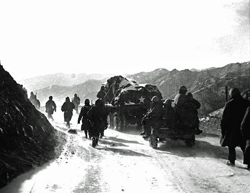 But our journey to the Chosin Reservoir there were other significant and historic battles. 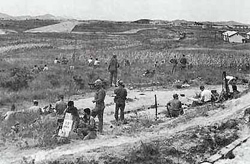 The first was the desperate battle at the Pusan Perimeter at a time when the war was going badly for our side. The second was the daring amphibious landing at Inchon followed by the bloody Second Battle for Seoul. As we entered the Port of Pusan, every Marine sailing on the USS Pickway was standing on the deck watching a chaotic scene of ships from various United Nation (UN) countries hastily offloading troops, equipment, ammunition, food and other supplies. In the distance we could hear continuous explosions. Once our ship docked, we quickly moved ashore. Within an hour, we were rushed into the westernmost flank of the perimeter to fight off the North Korean Army mounting a major drive to overrun that side of the perimeter. Within a day, our brigade became part of Task Force Kean, a combined Army and Marine force ordered by Army Lt. Gen. Walker, the 8th Army commander in Korea. For three days of heavy fighting, the battle lines moved back and forth until our task force, supported by Corsairs from the 1st Marine Aircraft Wing, clobbered the North Korean Army, forcing them to retreat north. A few days later, they began attacking again in greater numbers and again, pushed back our lines toward the Port of Pusan. Several large and bitter battles were waged along the Naktong River were both sides suffered heavy casualties. I remember sitting on a hill overlooking the river as Marine Corsairs pounded enemy soldiers crossing the river. Hundreds were killed and wounded. The next day, I watched Corsairs wiping out a large column of North Korean motorcycles. By nightfall on August 18, although many of the North Korean units had been annihilated, those remaining fought with fierce determination. Eventually many were killed, wounded or captured. The enemy units that did survive retreated north toward Seoul. 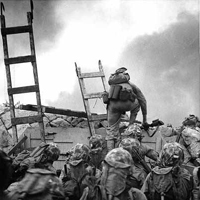 When the Battle of the Pusan Perimeter ended in early September, the 1st Provisional Marine Brigade had suffered 500 casualties and was preparing to evacuate to Japan. In one month we had seen enough death and destruction to last a lifetime. But that’s not what happened. Along with Marine reinforcements from Camp Pendleton, our brigade re-formed into the 1st Marine Division under the command of Maj. Gen. O.P. Smith. I was assigned to Gulf Company, 3rd Battalion, 5th Marine Regiment. 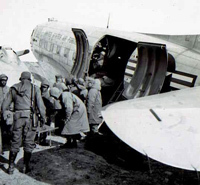 Within a week we made the daring landing at Inchon on the western edge of South Korea just below the 38th Parallel. On September 14, 1950, every Marine in our regiment was standing on the deck of the transport ship USS Diachenko watching destroyers and cruisers bombarding the North Korean defenses at Inchon and the island of Wolmi-do, where, the next day, my Marine regiment was to make an amphibious landing. We were to be the lead element. I was absolutely certain we were about to enter the meat grinder. At 6:30 on September 15, my buddies and I climbed down the cargo nets into an awaiting LST (Landing Ship Tank) bobbing in the water. As we scrambled aboard, our planes were softening up the beach with bombs, rockets & 20mm machine gun fire. The USS Missouri was pounding the shore line with its 16-inch guns. As the preparation fire began to slack off, we began our journey inland, nervously waiting for enemy indirect fire to take us out at any minute. That didn’t happen. When we did get ashore on the northern side of Wolmi-do, resistance was light. By noon, we captured the entire island at the cost of just 14 casualties. 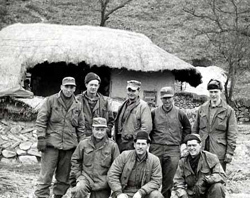 The next day we joined other units in the battle for Inchon and by the afternoon, the city was in our hands. Because the North Koreans had not expected an invasion at Inchon, not many troops were defending it. It was a different story as we moved overland to Seoul. The North Koreans fought us every inch of the way. Before we could actually enter the city of Seoul, we had to cross the wide Han River. North Koreans had placed major artillery positions on the other side and as our regiment crossed in nearly 100 “Ducks” (amphibious trucks), we were under constant bombardment. From our side of the river, we let loose with massive artillery barrages. The date was September 22, 1950. With shells from both sides roaring over our heads, we moved across the river expecting any moment to be shot out of the water by enemy artillery and mortar fire. Some Ducks were hit and many Marines died. Somehow, none of our company’s Ducks were hit. Our advance on Seoul was slow and bloody. The enemy was heavily fortified and our casualties mounted in desperate house-to-house fighting. We had done some house-to-house fighting but not on such a large scale. 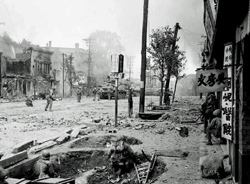 The second day of the battle for Seoul, we were in the outskirts of the city when we ran into a well-fortified enemy company. Each time we advanced on their positions, we were cut down my heavy machine gun and mortar fire. Hidden snipers would pick off Marines with ease. When we finally received the artillery we’d called in 20-minutes before, the battled quickly shifted in our favor. When the artillery barrage was lifted, we carefully began mopping up. My squad was ordered to move through some bombed out houses along a narrow side street and root out any enemy still alive. Bobby Joe and I entered one house where two enemy were hiding, one badly wounded. We opened fire the same time they did. They missed, we didn’t. But what I saw next as we continued moving down the road has haunted me all my life. Laying in the doorway of one of the ruined houses was the dead body of a three or four year old Korean girl. I looked down at her motionless body and her dirty, lifeless face frozen in child’s innocence. I broke down in tears. We passed up the house without searching it. After securing Seoul, our Division moved back to Inchon where we boarded ships that took us around to the east side of the Korean Peninsula. We didn’t realize it then but we were about to enter the fiercest, bloodiest battle of the Korean War. It was a very cold day in late October when we came ashore at Wonsan, North Korea. The next day we began our climb toward the Taebaek Mountains and the Chosin Reservoir. We’d heard we were heading for the Yalu River separating China from North Korea and that Gen. Douglas McArthur may later have us push into China. That whole idea sounded crazy to me. Why, I thought, would we mount a major battle in the roughest terrain in North Korea in the beginning of winter? 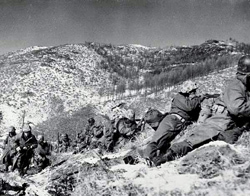 On our march to the Chosin Reservoir we had a number of firefights with small bands of North Koreans and a few with Chinese troops. We were told the Chinese were only volunteers. What none of us know at the time, including McArthur and his staff, was that the Chinese had secretly crossed the border into North Korea with 400,000 regular army troops. Something else we didn’t know at the time was the man in charge of the whole operation had made many tactical and strategic blunders. Army Maj. Gen. Edward Almond, commander of our combined force of Army, Marine, South Korean and British Commando units had spread his troop too thin along a huge 400-mile front. This resulted in major units unable to support each other during combat. After a week’s march into the mountains, our division reached the Chosin Reservoir near Changjin Lake. A Y-shaped defense facing north was established around the reservoir. After a little shuffling around, eventually the U.S. Army was on the eastern flank while our regiment occupied the high ground on the western flank near Yudami-ni . To our south was the 7th Marine Regiment. Fourteen miles further to our south at the base of the Y-shaped defense was the 1st Marine Division headquarters at Hagaru-ri, defended by the 3rd Battalion, 1st Marine Regiment. Gen. Smith ordered a small airfield built so he could fly out casualties and bring in badly needed supplies. Predictably, Gen. Almond thought it was a waste of time and effort. It was another of his strategic blunders. After several days in position awaiting further orders from Gen. Almond, a cold front from Siberia swept over the Chosin Reservoir, plunging the temperature to as low as −35 °F. I’d never been as cold in my life and thankfully, never have been again. Turns out it was the harshest winter in Korea in over a 100 years. For several days the only enemy our patrols found were less than squad size. That changed on the night of November 27. Right after dark from across the Valley to our north came repeated calls of “Marines you die” in broken English. We knew that meant we were in for a world of hurt but we didn’t know when it was coming. Sometime after midnight, it came. Dozens of bugles, horns and whistles shattered the quiet. We immediately fired illumination flares and couldn’t believe our eyes: thousands of screaming Chinese were coming at us in wave after wave from the valley floor. We fired everything we had at them as they grew closer and when they began mixing in with us, we fought them in hand-to-hand combat using our bayonets, K-Bar knives, rifle butts, even fists. Some of our men died while in their sleeping bags. We eventually beat them off, forcing them to retreating back into the dark night. At first light we got our first look at all the thousands of dead and wounded Chinese strewn around the battlefield. A great number of Marines also lay dead on the frozen ground. In this first attack of many to follow, the Chinese established a wedge between the 5th & 7th. Each Marine regiment was now surrounded, isolated by a Chinese force outnumbering us 8 to one. Nearly every night the same thing happened, starting with “Marines you die,” followed by hordes of Chinese blowing bugles, whistles and horns while attacking up our hill and into our positions where again, it was hand-to-hand combat before the enemy retreated. This constant battle took its toll. We were all hungry, tired, worn out and very, very cold. But in spite of feeling like zombies, we still managed to hold off the enemy assaults night-after-night. During one battle, my best friend, Bobby Joe Wilder, was badly wounded. Bill Heinz, another friend, was so badly frostbitten he had to have both legs amputated at the hip. The Army’s Regimental Combat Team-31 (RCT-31) on the east fell after a few days. Hundreds of soldier died or were wounded when their positions were overrun. Hundreds more went missing. The scattered survivors withdrew toward 1st Marine Division headquarter at Hagaru-ri. Along the way many more died in Chinese ambushes. In the last week of November, all Marine units on the west flank were told to abandon its position and withdraw to Hagaru-ri to regroup with other Marine and Army elements in preparation for a total breakout from the deathtrap the Chinese had so skillfully set up. We placed our dead and wounded in trucks, on fenders and hoods and carried them out with us. As best we could, we made sure no one was left behind. Sadly, many of our comrades went missing. We fought a relentless enemy determined to wipe us out every inch of the 14 miles to Hagaru-ri. When we finally reached the 1st Marine Division headquarters in the early morning on December 4, we somehow managed to get into some semblance of a formation and limped in singing the Marine Hymn. Many of the badly wounded, many on deaths doorsteps, were flown out from our airfield, the one Gen. Almond had pitched such a fit over. While we were at Hagaru-ri, the Chinese attacked from all directions every night. And every night, they were driven back. After a short rest, our breakout began on 6 December with the 7th Marines on point and our regiment covering the rear of the retreating column. At Koto-ri we married up with a battalion from the 1st Marine Regiment and continued our slow march down the narrow winding road through the mountains. It was hard to keep moving. We were overly exhausted and extremely cold and the road was in bad shape. At times it turned into nothing more than a dirt path with steep hills and drop offs on both sides. But the biggest problem was the Chinese. They were relentless in trying to destroy. From the peaks, North Koreans and Chinese in bunkers on both sides fired down on us. Enemy ground troops attacked us whenever the road would narrow, bringing the withdrawal to a slow crawl and creating chaos in our ranks. We were again fighting desperately for our lives but this time in the open with no place to go. When we reached Funchilin Pass, we found the enemy had blown up a vital bridge. Our path to freedom was blocked. The enemy mercilessly attacked us where we stood. I figured this was the end. Fortunately our situation improved when Marine Air dropped bombs and napalm on the enemy positions. As I watched the aircraft come in sortie after sortie, I couldn’t help think that without the Marine Air, a lot more of us would never have survived. That night we fought off numerous enemy attacks and the next morning, watched C-119 (flying boxcars) drop portable bridge sections by parachute. Army and Marine engineers reassembled the bridge sections while we climbed the hills to keep the enemy at bay. My squad was on point. That afternoon we moved across the bridge. We finally reached the Hungnam perimeter at 11pm, December 11, 1950. The next few days we loaded onto transport ships. We also evacuated 91, 000 North Korean civilian refugees, crowding them on the decks of the same ships carrying us out. I heard somewhere that hundreds of thousands of South Korean citizens are direct descendants of those refugees we saved. From the deck of the ship I was on, I watched as tons of explosive blew Hungnam to smithereens, leaving the enemy nothing but a destroyed city and harbor. 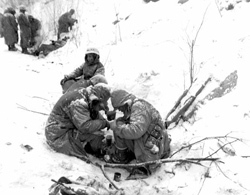 Chosin Reservoir was a costly battle for both the UN forces and the Chinese. We lost 1,029 killed, 4,582 wounded, 4,894 missing and 7,338 non-battle casualties, mostly frostbite injuries. It is estimated the Chinese suffered 60,000 casualties. I fought in a few more battles but never anything as big as Pusan, Seoul or the Chosin Reservoir. After seven months in country, myself and most of the Marines I was with were replaced by Marines fresh from the United States. I left Korea a much different man than when I had arrived. Naval Ammunition Depot in Arkansas. It was the easiest duty I’d ever seen or heard of the Marine Corps. To begin with, I worked only one day out of seven as the Sergeant of the Guard. I would ensure all the Marine sentries on my watch were squared away and carrying on their duties. Because it was a small contingent, my time was split between checking on the guards and monitoring the radio in the guard house. When I was off duty, I had open gate liberty. That means I could come and go as I pleased, which I did. Working a no-pressure job with plenty of time off allowed me the luxury of sorting out my feelings about what I saw and did during the Korean War. I believe it prevented me from entering that dark place so many combat veterans have been lost in. When I was in Korea, my company commander, Capt. Charlie Mize and I grew pretty close. We saw a lot of combat together and spent some quality time talking about home when were not fighting for our lives. He was a good officer who took care of his men. I respected him greatly. Sometime around 1990, I was glancing through a VFW magazine and came across a notice of someone named Tex Downs who was looking for people from Gulf Company, 3rd Battalion, 5th Marines during the Korean War. I wrote him telling him about my time in the company and how Charlie Mize was my company commander. It turned out Tex Downs was a platoon leader I didn’t know who had served in the company after I left Korea. He sent me a picture of him, Charlie and a few other officers and gave me Charlie Mize’s address. I also learned from Tex that Charlie had retired as a Major General and at one time commanded the 1st Marine Division. I send a letter to Charlie and wondered if he would respond or not. When I told my ex-wife and her husband I had written the letter, they both said he would never answer me back. He was after all a general who had tens of thousands of men under his command throughout his career and I was just a sergeant he would never remember. Five or six days later, I got a letter from him and a command photo of him as a Major General. He wrote he remembered me very well and was glad I was doing good. General Mize died in 1997 at the age of 77. After capturing Kimpo airfield midway between Inchon to Seoul, our battalion moved out toward the Han River. By this time I was a fire team leader. Our platoon was on the left flank, moving through steep hills and open land. My squad was on point and we’d been told to expect seasoned North Korean soldiers determined to stop our advance. As we came over the crest of a hill, all hell broke loose. We were immediately pinned down by heavy small-arms and automatic weapons fire. Our squad leader, R.L. Clark, and I were laying close to each other as bullets whined overhead, others digging into the ground around us. Clark carefully peeked over the hill, took out his binoculars and raised them to his eyes hoping to get a better view of the enemy situation. He no longer got the binoculars up when a single bullet tore through the left lens. He died instantly. I was enraged. I wanted to kill whoever it was that had killed Clark. I began crawling forward toward the enemy position. I looked back to see who was with me only to discover I was all alone. The rest of the squad was still behind the hill. Made no difference to me. I was on a mission to kill as many North Koreans as I could, with or without help, figuring the one who killed Clark would be among them. I crawled up to a slight rise and saw enemy fox holes connected by a four-foot deep trench. I inched my way behind them and opened fire with my M1 Rifle, stopping only to throw a couple of hand grenades and to reload my rifle. The enemy were falling like bowling pins. That’s when my fire team caught up with me and together, we starting firing down the line of fox holes. Within minutes the enemy was destroyed. For this action I was awarded the Silver Star Medal. 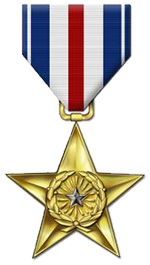 The Silver Star Medal. It is an honor I value above any in my life. But it is not my honor alone. I share it with every Marine who was with me that day. We were a team doing what Marines are trained to do: kill the enemy before he kills you and to take whatever action is necessary to protect your buddies from death or injuries. Photo on the right is of three men I served with during the Korean War: Left is Mel Rasmussen, who stayed in the Marine Corps with a combat tour in Vietnam; Center is Bobby Joe, my best friend who died of cancer; Right is Blackie Cahill, my platoon leader who retired a colonel. Not sure who the guy in the background is. After we captured Kimpo airfield from the North Koreans, Bobby Joe and I settled down for the night in a foxhole we had dug earlier near the runway. We’d been told to expect a North Korean counter attack that night. We were both a little nervous because our view in the direction in which the enemy was expected to attack was blocked by bushes 4 to 5 feet tall. My watch was the first half of the night and almost the whole time a steady wind kept blowing the bushes. Every time the wind would gust, I thought the enemy were sneaking up on us. I was super alert and especially watchful when illumination flares fired by Naval guns off shore went off overhead. In addition to constant watching for the enemy, I fought pesky mosquitoes all night. They had gotten so bad, I rolled down the camouflage netting from my helmet and tied in under my chin. When my watch was finally up, I went back to our foxhole where Bobby Joe was sleeping and shook him awake. He was sleeping soundly and when he finally opened his eyes, fear spread across his face. He instinctively kicked my legs out from under me and jumped up with his K-Bar combat knife in his hand, ready to do battle. I grabbed his knife arm as the two of us wrestled to the ground, me yelling for him to stop and that it was me. When he realized it was me, he yelled, “How the hell could I know it was you? You had that rag wrapped around your face, damn it! ” Every time we thought of it after that, we’d laugh. But I’ve always wondered what if he had stuck me with that K-Bar? He was barely awake, scared out of his wits and had every intention of killing the unidentified person he thought was about to kill him. Had he succeeded, I would not have been alive for these past sixty-odd years. 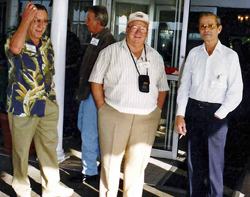 When I was stationed at Parris Island, S.C., me and this other DI were at a run-down bar somewhere near Walterboro. 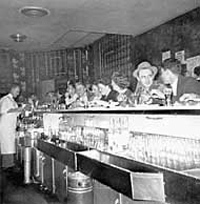 We’d been drinking quite a bit and were not totally in control of our good senses, when Woody spotted an attractive woman sitting at the bar. He got up, walked over and began flirting with her. This guy on the other side of her stands up from his stool, levels his eyes and in a menacing voice says, “Hey bud, this is my wife, do you mind?” Unflinching, Woody says, “No, I don’t mind.” I jumped up, grabbed Woody, saying something about his not meaning anything and got him out before a fight broke out. Now, I don’t know if this conversation originated with Woody in the Walterboro bar or if he had heard it before and decided this was a good time to try it out. Either way, I’ve heard this story as a “joke” many times since. Laying pipe is hard and dangerous. I remember one job in the Upper Peninsula of Michigan, near the shore of Lake Superior, that characterized both. 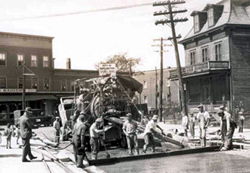 We were laying twenty miles of pipe through the Porcupine Mountains for the White Pine Coopering Mining company. While we expected it to be hard, we didn’t expect trouble between union and non-union contractors working on the same contract. One night one of our large semitrailers mysteriously burned and a fuel tanker blew up. We figured it might be mining company workers because whoever did it knew how to handle the kind of explosives commonly used in mining. The culprits put an explosive charge on top of the truck transmission which then blew through the cab floor and out through the roof. It looked like a huge can opener had torn it open. At the same time this was going on, Van Ess had another crew working in Florida. One morning a boring machine operator noticed extra wires attached to his equipment. Explosive experts were brought in to check it out. I heard a bomb went off in the bore pit, hurting at least one person. That spooked all of us operators. From then on, we carefully checked over our machinery before we would ever turn a key. It was on this same job in the Pine Mountains that I nearly lost my life. Running through the area was the Potato River, which had steep hills along much of its banks. On our side, we had dug trenches for the large pipes to be laid. On the opposite side where we were heading was a particularly large and steep hill. On the top of that hill was a gravel road the gas company wanted us to carefully dig or bore under so as not to cause an erosion of any kind. A boring crew on the top of the hill on the opposite side began boring under the road at a very steep angle. Since I couldn’t get the Case track hoe across the river, it was loaded and hauled around by road to where the pipe line was to continue. My job was to remove rocks the trencher couldn’t and to dig for pipe bends where the ditch had to be very wide. A cable was put on the back of my Case track hoe to secure me as I was let down over the steep side. When I got down to the river’s edge, the cable was removed. By the end of the day, I had dug a path for the pipe to be laid and prepared to be pulled back up the steep hill. A crew members came over the top of the hill dragging a cable and hooked me up to reverse the method we’d used to get me down. Once the cable was secure, they began winching me up the hill. I was helping with the lift by pushing with the hoe when suddenly the hoe began slipping back down the hill. I quickly jammed the hoe bucket into the ground and looked up the hill to see what was going on. 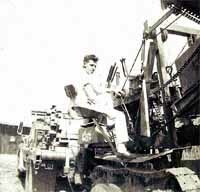 I saw our foreman, Bob Morris, standing beside a winch truck. The driver had the truck door open and was trying to jump out. Bob pushed him back into the truck. I learned later Bob ordered him to step on the clutch to stop the winch from slipping. If the guy operating the winch had abandoned his truck with the winch still running, it would have pulled the truck over the edge, taking me and the Case track hoe along with it to the river 100-feet below. Bob saved my life that day. After several decades of working the pipelines all over American, I retired. I bought a house for my family on the Ouachita River in Arkansas and can honestly say I am finally at peace with the world. For many years I have thought about things that happened to me in combat. Now I am with a bunch of guys who have seen as bad or worse. Some were in my war in Korea, others are veterans of World War II, Vietnam and wars in the Middle East, but no matter which war, we are a Band of Brothers in the strictest sense of the term. TogetherWeServed.com keeps it alive. does he have any grandchildren? ?